Motorists and commuters in and around Derbyshire are being warned about the following delays and disruptions to travel today, Monday, November 9. A5121 Staffordshire - Slow traffic on A5121 Derby Road in Burton Upon Trent between the Beech Avenue junction and the Princess Way junction. In the roadworks area. A610 Derbyshire - Slow traffic on A610 Ripley Road in Buckland Hollow at The Excavator pub, because of a traffic light failure. In the roadworks area. A6002 Nottinghamshire - Slow traffic on A6002 Low Wood Road southbound in Nuthall between the Hempshill Lane junction and Nuthall Island. 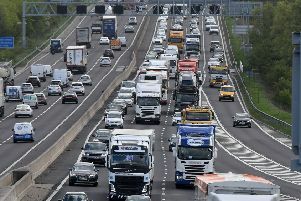 M42 Leicestershire - Very slow traffic on M42 southbound between J11, A42 (Burton-Upon-Trent) and J10, A5 (Tamworth). Travel time is 20 minutes. A38 Derbyshire - Slow traffic on A38 southbound in Derby between Palm Court Island and Markeaton Island. A61 Derbyshire - Slow traffic on A61 Sir Frank Whittle Road inbound in Derby at Pentagon Island.